Luxola offers 50% off all Grooming Lounge products for father's day. No code needed. Promotion ends this Sat Jun 2. As promised, here're some updates on Robinsons GSS Summer sale starting Jun 1. Members get to enjoy $20 voucher with any $200 beauty purchase, on top of normal 5%-10% credit card rebate. Click to enlarge. 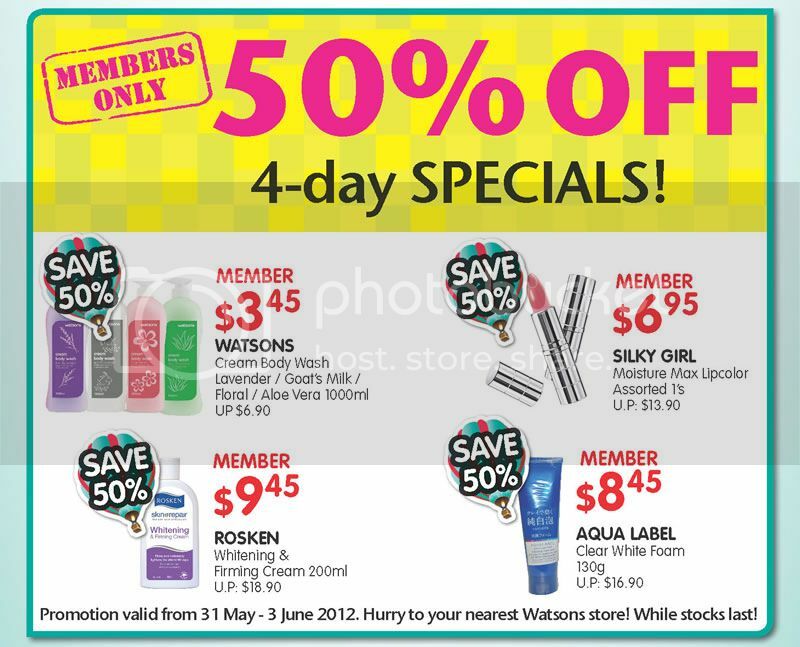 Watsons is having 50% off member's special buy event. Check their facebook for more details. Promotion ends Sunday Jun 3. Afterglow Cosmetics offers free shipping with any purchase. No code needed. Valid for May 31 only. Anthony Logistics for Man offers free Tool Kit (a $20 value) with any $75 purchase. No code needed. Valid thru Jun 10. Plus you get free shipping with any purchase now thru Jun 5. AskDerm offers free shipping and 20% off with any purchase. Enter code 20PMD12 at checkout. Valid for May 31 only. Bath & Body Works offers Buy 3 Get 3 Free all body care products (save up to $103.50). Plus enjoy $1 shipping with any $25 purchase using code SIGNATURE25 at checkout. Valid thru Jun 3. Beauty.com offers free deluxe sample of Jack Black Supreme Cream Triple Cushion Shave Lather with any $10 purchase. Enter thru link. While supplies last. Beauty.com offers 70% off all Alterna Hemp products. Click the banner at the homepage to enjoy the offer. No code needed. While supplies last. Can be combined with the Jack Black deluxe sample offer. BH Cosmetics offers free surprise gift with purchase of the new 40 Color BH Party Girl Eyeshadow Palette. Enter code SURPRISE at checkout. While supplies last. Birchbox offers 20% off any full size product purchase of $35 or more. Enter code 20foryou at checkout. Valid thru Jun 3. Bloom.com offers $10 bonus cashback and free shipping with any $50 purchase. Plus you receive 10% cashback on any purchase (total 30% cashback if you spend $50). Enter code MAY10BACK at checkout. Valid thru Jun 2. Caudalie offers free 10ml deluxe samples of Vinoperfect Day Perfecting Fluid SPF15 and Cell Renewal Night Cream (a $44 value) with any $75 purchase. Enter code SUMMER at checkout. Valid thru Jun 6. Dermstore extended their Spend More Save More promotion. Get $20 off $100 with code DSSAVE2, $30 off $150 with code DSSAVE3, or $40 off $200 with code DSSAVE4. Plus ge a free mystery gift with any purchase. Extended for May 31 only. E.L.F. Cosmetics offers free shipping with any $25 purchase. Enter code SHIP25 at checkout. Valid thru Jun 4. 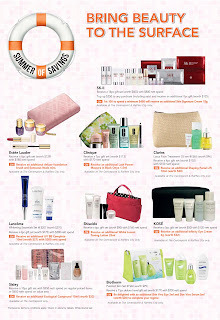 Plus they are having a Steal vs Splurge collection for only $14 (competitor's set priced at $191, a 93% saving). MAC Cosmetics offers free 2nd day shipping with any purchase. Enter code DITTO at checkout. Valid thru Jun 1. MyChelle offers 20% off and a free 130ml Fruit Enzyme Mist (a $27 value) with any purchase sitewide. Enter code maysavings at checkout. Valid for May 31 only. Pur Minerals offers a free Summer On the Go 7-pc kit with any $30 purchase. The Kit worth $79.50 includes On the Go Eye Trio, deluxe size Impact+ Mascara, Mini Eye Shadow Brush, Mini Powder Brush, Lip Brush, Pur Radiance, and Iced Pearl Lip Gloss. Enter code ONTHEGO at checkout. Valid thru Jun 3. Sabon offers free shipping with any $49 purchase. No code needed. Valid thru Jun 6. Stila Cosmetics offers free shipping and 20% off sitewide in their Friends and Family Sale. Enter code FRIENDS12 at checkout. Valid thru Jun 3. Too Faced offers an exclusive limited edition 5-piece Bronzer Value set at only $49. The set has a $160 value and includes Deluxe Primed & Poreless SPF20 Bronze Tint Face Primer, Glamour Gloss Volumizing Lip Gloss in This is Pretty!, Royal Oil Coconut Oil Body Bronzer, Deluxe Tanning Bed in a Tube Sunless Tanning Lotion, and Milk Chocolate Soleil Matte Bronzer. While supplies last. Ulta Beauty offers $15 off any $75 purchase with free shipping. Enter code AF512 at checkout. Valid thru Jun 23. Wei East offers free shipping with any $35 purchase. No code needed. Valid thru Jun 4. Clarins is having a new counter at Metro Paragon and offers some exclusive promotions there. Includes Shaping Facial Lift duo pack, 8pc gift set with any $350 purchase, and $20 metro voucher with any $100 Clarins purchase. First 100 customers will receive an additional gift set worth $50. All promotions start tomorrow May 31 till Jun 3. 100% Pure offers free Strawberry Lip Gloss, Cruelty Free Blush Brush and Strawberry Blush (a $56 value) with any $150 purchase. No code needed. While supplies last. 100% Pure offers 10% off Red Wine Resveratrol products. Enter code RESVERATROL at checkout. Valid thru May 31. Ahava offers free Rebecca Minkoff tote with any purchase of 2 full size products. Enter code MINKOFF12 at checkout. Ends May 30 midnight. Aveda offers free shipping and free Best-Sellers trio with any $30 purchase. Gifts include deluxe samples of Damage Remedy Restructuring Shampoo, Botanical Kinetics Purifying Gel Cleanser, and Damage Remedy Restructuring Conditioner. Enter code BEST52 at checkout. Valid thru May 31. Beautorium offers 20% off Saaf Natural Beauty Products. Plus a free gift with any purchase. No code needed. Valid thru Jun 6. BeautySak offers free shipping and 15% off any $65 purchase. Enter code 15OFF at checkout. Valid thru Jun 4. Kai and Alterna products excluded. Benefit Cosmetics offers free Concealer Brush (a $22 value) with any $60 purchase. Enter code ERASEIT at checkout. Valid thru May 31. BH Cosmetics offers free Lush Gel Eyeliner with any $25 purchase. Enter code LUSH at checkout. While supplies last. Bliss offers 30% off on select Bliss and Remede bundles. No code needed. Valid thru May 31. Plus receive $25 off any MBT purchase with code MBT25. Valid thru Jun 3. Chantecaille offers a full size Les Bijoux Eyeliner Palette with any $200 purchase. No code needed. While supplies last. Clinique offers free 2 Superbalm Moisturizing Gloss minis from 4 best-loved shades with any purchase. Choose your pick at checkout. If you spend more than $55. Enter code SUNNY at checkout to receive a free beach bag as well. Valid for May 30 only. Plus choose an additional deluxe sample at checkout. 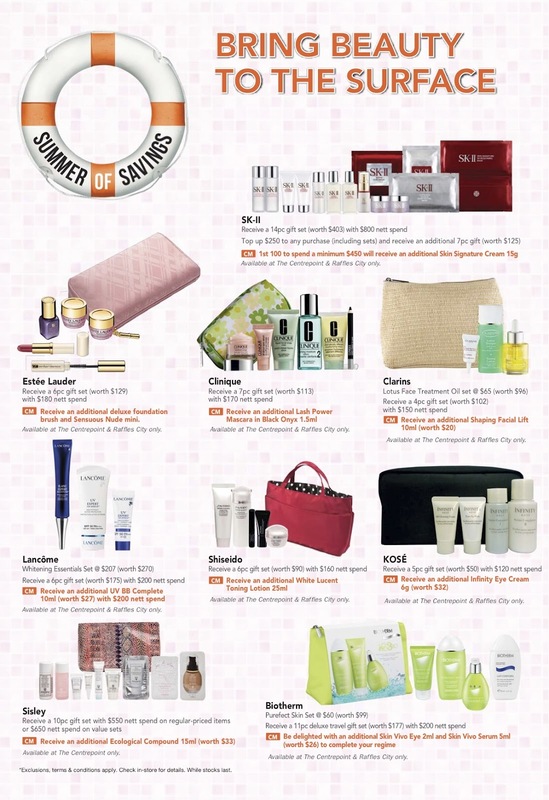 Elizabeth Arden offers free shipping with any purchase. No code needed. Must enter thru link. Valid thru May 31. Hautelook is having myfaceworks and Youngblood Cosmetics sale events today and tomorrow. 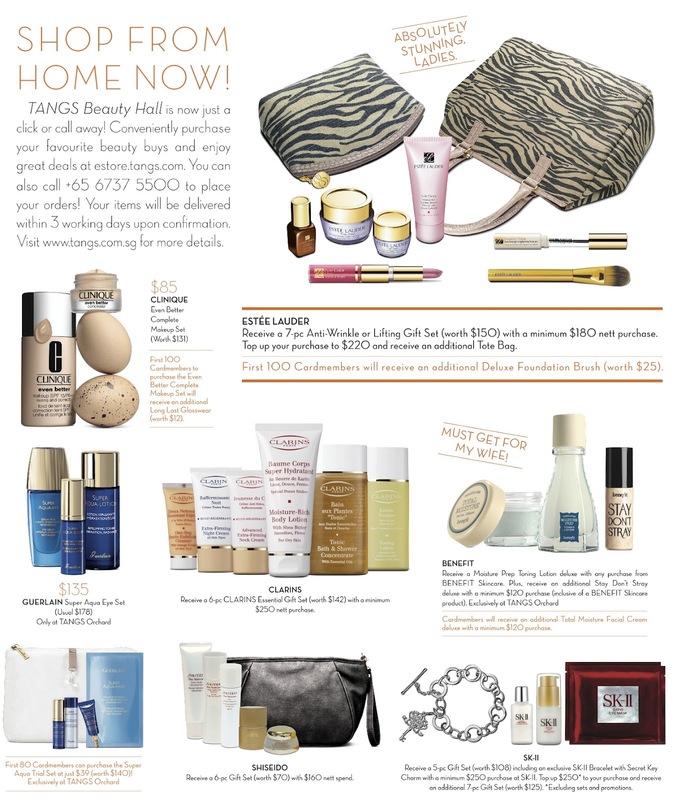 Mario Badescu Skincare offers free shipping with any $50 purchase. Enter code 744762 at checkout. End date unknown. Nordstrom offers free Tracy Reese for Clinique cosmetics bag filled with 7 pc deluxe samples with any $28 Clinique purchase. Whiles supplies last. Perfumania offers free shipping, Buy One Get One 50% off and free gift with any purchase. No code needed. Valid thru Jun 18. Prescriptives offers free shipping and deluxe samples of All You Need + SPF15 and All You Need + for Eyes with any purchase. No code needed. Valid for May 30 only. Sally Beauty offers 20% off any $50 purchase. Enter code 555422 at checkout. Valid thru May 31. SkincareRx offers 22% off sitewide. Enter code MAYEND22 at checkout. Some brands excluded. Valid thru May 31. Yves Rocher offers more than 250 travel size items from only $3. Plus get a Summer Kit with a tote bag for only $9.95. All offers valid thru Jun 11. 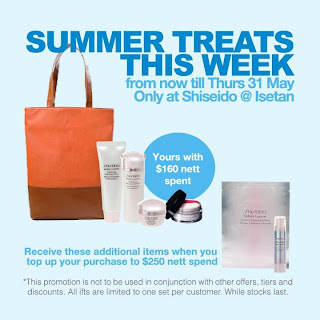 Shiseido offers GWP sets at Isetan with any $160 or $250 purchase. Ends Thur May 31. SK-II offers exclusive promotions at OG People's Park. 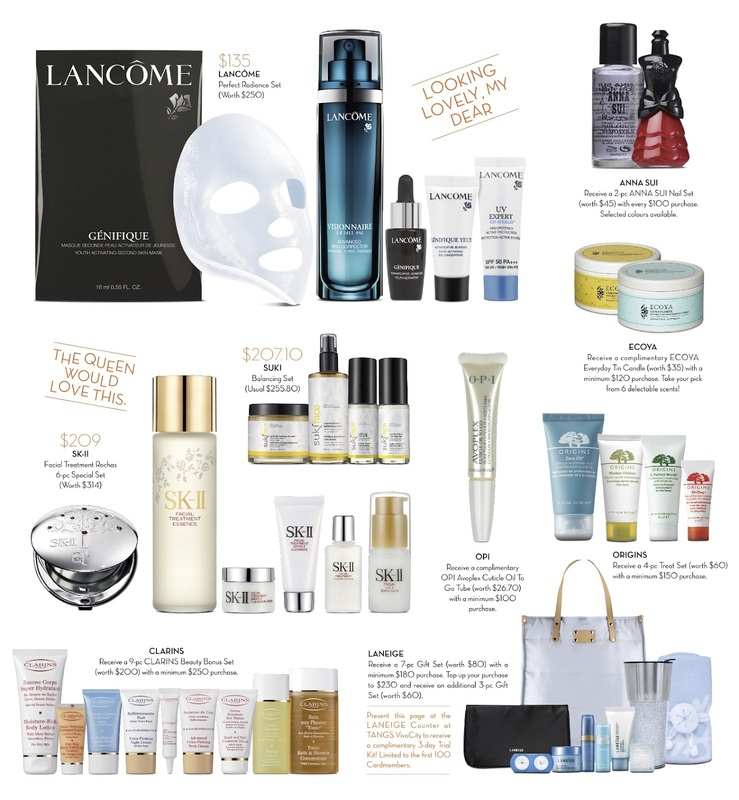 Receive GWP with any $250, $550 or $800 purchase of SK-II products. Plus flash the picture below to receive an additional Signs Eye Mask 1pc with any purchase. Promotion ends July 22. Ahava offers a free 4 piece Body Gift Set in a cosmetics bag with any men's purchase.Enter code GIFT4YOU at checkout. Valid thru Jun 4. Beauty.com offers free deluxe sample of Bliss The Youth as We Know It Anti-Aging Moisture Cream with any $10 purchase. Enter thru link. While supplies last. Bobbi Brown offers free shipping and deluxe sample of Vitamin Enriched Face Base 7ml with any purchase. Enter code BEACH12 at checkout. Valid thru May 31. Dermstore offers free shipping and a mystery gift with any purchase. While supplies last. E.L.F. Cosmetics offers e.l.f. studio 83 piece all-in-one Essential Make up Collection for only $3.5 (retail price $35) when you make $25 or more purchase. Enter code 83PIECE at checkout. Valid thru June 4. Elizabeth Arden offers free 7 piece gift set with any $49.50 purchase. Gift includes deluxe samples of Ceramide Plump Perfect Ultra Lift and Firm Moisture Cream SPF 30, Ceramide Gold Ultra Restorative Capsules Intensive Treatment for Face and Throat 7 pieces, Ceramide Purifying Cream Cleanser, High Shine Lipgloss in Pink Pout, Ceramide Ultra Lipstick in Coral, Ceramide Lash Extending Treatment Mascara in Black, and Floral Cosmetics Zip-Top Case. Enter code BRIGHT at checkout. Valid for May 29 only. Estee Lauder offers free super summer trio with any $50 purchase. Gift includes deluxe samples of Sumptuous Bold Volume Lifting Mascara, Pleasures fragrance, and Matte Perfecting Primer. Enter code SUPERSUMMER at checkout. Valid thru Jun 3. Folica.com offers 20% Off Sitewide. Enter code LOCKS20 at checkout. Valid thru May 31. Fresh offers free deluxe sample of Seaberry Restorative Body Cream with any $100 purchase. Enter code CEW at checkout. Valid thru May 31. La Mer offers free shipping and a deluxe 30ml sample of the Cleansing Lotion with any purchase. Enter code OCEAN at checkout. Valid thru Jun 3. La Prairie offers free 3 piece White Caviar gift sets with any purchase of White caviar full size items. Gift includes hand, eye and face cream deluxe travel sizes. No code needed. While supplies last. Perfume.com offers 15% off sitewide. Enter code DAD at checkout. Valid thru June 6. Philosophy offers free shipping on all orders. Enter code father at checkout. Valid thru May 30. QVC today's special value TSV is Neutrogena Dermatologics Retinol Nx Anti-Aging Duo. Special price of $99.96 ends 5/29 at 11:59 PM ET. Skin1 offers free shipping and 10% off sitewide. Enter code Memor10 at checkout. Valid for May 29 only. Trish McEvoy offers free shipping and a deluxe sample of Beauty Booster Balm SPF 15 with any purchase. No code needed. Valid thru Jun 1. Dirty Works (which is Sainsbury's attempt at the budget Benefit look make-up that seems to be popping up all over the place recently, and I got to know the brand from recent Vanity Trove) offers 20% off when you spend $50 and more. Enter code glamovictoria01 at checkout. Update: Ends on Jun 4. 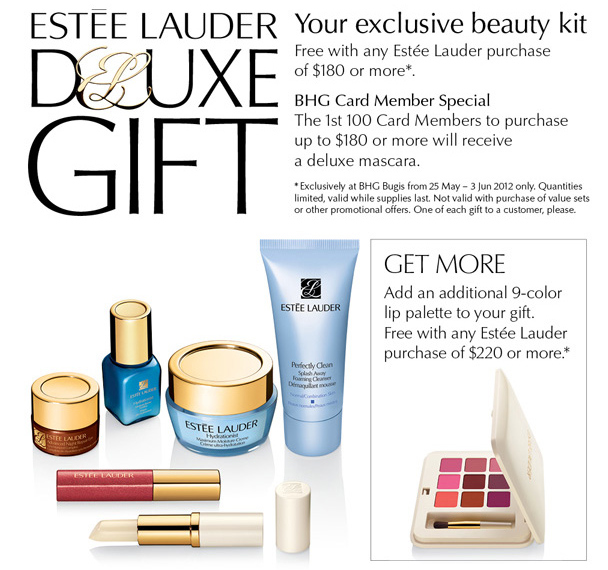 Estee Lauder at BHG Bugis offers free a 6pc Beauty Kit with any $180 purchase. Members get to receive an additional deluxe mascara. Plus get an 9 color lip palette if you top up the spending to $220. Valid till Jun 3. Luxola.com offers free Nail Rock nail wraps (a $16 value) with any purchase of 2 Deborah Lippmann nail polishes. Valid thru Jun 3. Ahava offers Buy 1 Get 1 50% off with any purchase. Enter code FBBOGO12 at checkout. Valid for May 28 only. Beyond the Rack is having a Best of Beauty sale event. Brands featured includei.d. bare essentials, Clarins, Elizebeth Arden, Bobbi Brown and more. Chantecaille offers free deluxe samples of Flower Harmonizing Cream, Detox Clay Mask, Stress Repair Concentrate, and Jasmine and Lily Healing Mask with any $150 purchase. No code needed. While supplies last. DermStore offers $20 off any $100 purchase. Enter code DSSAVE2 at checkout. Or $30 off any $150 purchase with code DSSAVE3, $40 off any $200 purchase with code DSSAVE4. Plus receive a free gift with any purchase. While supplies last. 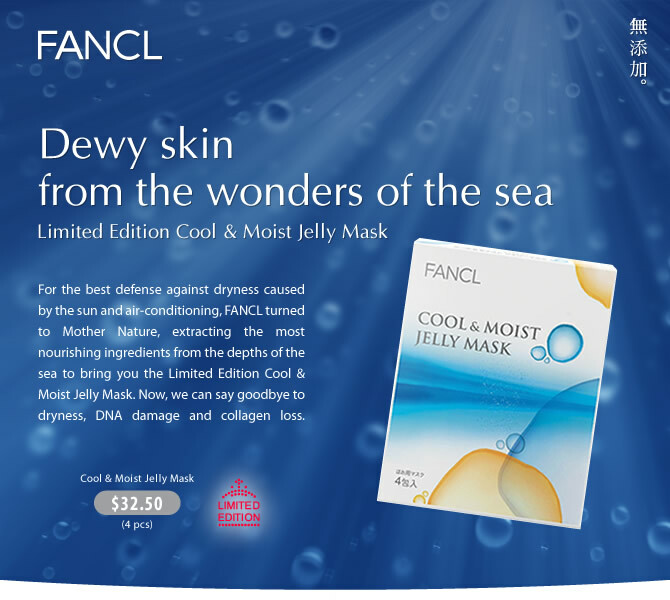 Dermstore offers 20% off all Renucell products. No code needed. Valid thru Jun 3. Elizabeth Arden offers 25% off any purchase. Enter code MEM25 at checkout. Valid thru May 29. Juice Beauty offers free shipping with any purchase. Enter code 24FREESHIP at checkout. Valid for May 28 only. Lancome offers free sample of Visionnaire with any purchase. Enter code VISIONNAIRE at checkout. Whiles supplies last. Laura Geller offers 20% off any $30 purchase. No code needed. Valid thru May 29. Perricone MD offers Vitamin C Ester 15 at $99 (a $120 value). Enter code PREVIEW at checkout. Valid thru May 29 11am PT. Sephora 15 days of beauty thrills has entered the 8th day. Enter code 15DAYS with any $25 purchase and the gift with purchase changes everyday at 12 midnight. Today's gift is a deluxe sample of Tarina Tarantino Sparklicity Gloss, and tomorrow's will be a deluxe sampl of Chloe Long Vial. 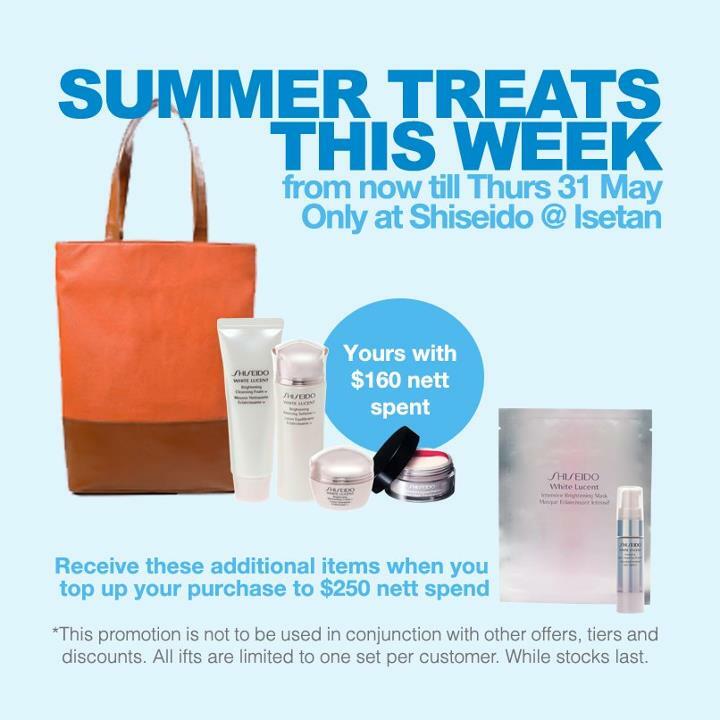 Shiseido offer a free deluxe sample of Bio-Performance Advanced Super Revitalizing Cream with purchase of any serum. No code needed. While supplies last. Kose is offering 2 limited edition Save the Blue Sekkisei products. For every purchase of these products, Kose will donate part of the proceeds to the research, education and conservation efforts of Singapore coral reefs. One of the products is Sekkisei Travel Set which is very worth it, selling at $142 its retail value is $209; The other one is limited edition Sekkisei lotion goes for $121 the same as normal edition. Plus you can meet Taiwanese actres Ariel Lin 林依晨 and Mediacorp actor Lee Teng at Kose Save the Blue Event. On 2 and 3 June, 3pm to 5pm, the event will be at Tampines Mall Atrium. 100% Pure offers free shipping with any purchase. No code needed. Valid thru May 28. Anthony Logistics for Men offers $5 off any purchase. Enter code anthony4dad at checkout. Valid thru Jun 17. Aveda offers free shipping and Prep Sample Trio with any $30 purchase. Enter code WKND52 at checkout. Valid thru May 27. BareMinerals offers 30% off on selected products. Enter thru link. Valid thru May 25 9pm PDT. Plus receive a free mini Refillable Buffing Brush with any $65 purchase. Enter code BUFFING at checkout. While supplies last. Beauty.com offers free deluxe sample of Korres Quercetin & Oak Antiageing Antiwrinkle Day Cream with any $10 purchase. Enter thru link. While supplies last. Beauty Bridge offers free shipping and 10% off storewide. Enter code memo10 at checkout. Valid thru May 29. Beauty Encounter offers an extra 10% off sitewide. Enter code MEM752 at checkout. Valid thru May 28. Beauty Habit offers free shipping with any purchase. Enter code HADALI at checkout. Valid thru May 28. Bliss offers a free Thairapy 365 Leave-In Conditioner (a $35 value) with any Thairapy 365 purchase. Use code HAIRGIFT at checkout. Valid thru June 30. Bloom.com offers 30% cash back on all orders during the 5 day Memorial Day Weekend Promotion. No code needed. Valid thru May 29. Carol's Daughter offers free shipping with any purchase. Plus receive a full size Black Vanilla Moisturizing Leave In Conditioner with any $40 purchase. No code needed. Enter thru link. Valid thru May 28. Cosmedix offers free deluxe size of Define Resurfacing Treatment with any $50 purchase. Enter code FREEDEFINE at checkout. Valid thru May 28. Dermstore is having a Secret Sale where everything goes for $10 only. Enter thru link. Valid thru May 28. Elizabeth Arden is having a private Friends & Family event. Save 30% off selected skincare with code FRIENDS30 at checkout. Valid thru May 28. Erno Laszlo offers free shipping with any purchase. Enter code SUMMER12 at checkout. Valid thru May 28. Folica offers 20% off items from Folica's Top Ten lists. Enter TOPTEN20 at checkout. Valid thru May 28. H2O Plus offers free shipping with any purchase. Enter code NEWH2O at checkout. Valid thru May 28. Jurlique offers a Memorial Day tiered discount. Spend $100 Get 15% off with code MEM15; Spend $200 Get 20% off with code MEM20; Spend $300 Get 25% off with code MEM25. All codes valid thru May 28. Perfume.com offers $7 off any $70 purchase. Enter code SEVEN70 at checkout. Valid thru May 28. Plum District offers 20% off storewide. Enter code MEMORIAL20 at checkout. Valid thru May 28. Sabon offers free mini Body Lotion and Bar of Soap with any $30 purchase. No code needed. Valid thru May 29. Sally Beauty offers an extra 50% Off all Red Tag Clearance Items. Enter code 555100 at checkout. Valid thru May 28. SkincareRx offers 20% off selected top brands including Replenix, Obagi, PMD, RevaleSkin, Green Cream, M2, Dermalogica, Vivite, La Roche-Posay. Enter code MEMDAY20 at checkout. Valid thru May 29. Spalook offers up to 60% off Alterna, Philosophy and Ahava products. Enter thru link. Valid thru May 28. Spirit Beauty Lounge offers 4 day shop-a-thon tiered discounts. Get $15 off any $100 purchase, $25 off any $150 purchase, or $35 of any $200 purchase. Enter code MDW4D at checkout. Valid thru May 28. Stila offers free shipping and 20% off any purchase. Enter code 20OFF at checkout. Valid thru May 28. Time to Spa offers up to 30% off on select products at the Memorial Day Sale. Enter thru link. Offer valid thru May 31. Too Faced offers free shipping with any purchase. Enter code THANKYOU12 at checkout. Valid thru May 28. Yves Rocher offers free shipping and $10 off with any $40 purchase. Enter code LWK10 at checkout. Valid thru May 28. Zenmed offers $4 off any purchase of Stretta. Use code GCJ5023B5C8 at checkout. Valid thru Jun 1. 100% Pure offers 10% off all scrubs (face and body). Enter code EXFOLIATE at checkout. Valid thru May 24. Beautorium offers 15% off Patyka Paris products. Plus receive a Patyka Body Wash (a $45 value) with any $75 purchase sitewide. No code needed. While supplies last. Beyond the Rack is having a Women's Fragrances sale. Brands featured include Versace, Clavin Klein, Gucci, Dolce & Gabanna, Vera Wang, and more. Bobbi Brown offers a limited edition Travel Mirror 3 1/2" and deluxe samples of Crystal Lip Gloss and Lash Glamour Extreme Lengthening Mascara with any $75 purchase. Enter code SMOKEY at checkout. Valid thru May 24. Carol's Daughter offers $10 membership (regularly $25). Join today to receive 15% off and free shipping with any purchase. No code needed. Valid thru May 24. Clarins offers a 4pc Best Seller Gift Set with any $45 purchase. Gift includes travel sizes of Instant Smooth Perfecting Touch, Super Restorative Replenishing Comfort Mask, High Definition Body Lift and Pure Melt Cleansing Gel. Or get a 5th mystery deluxe sample plus Free Shipping with $75 purchase. Enter code BEST512 at checkout. Valid for May 23 only. Note that you can choose 3 more samples at checkout. Dermstore offers 15% off Replenix Sunscreen purchase. No code needed. While supplies last. Freeze 24-7 offers 20% off sitewide. Enter code MEMORIALDAY at checkout. Valid thru May 31. Giorgio Armani Beauty offers free 4 minis of your choice with any foundation purchase. Enter code FOUNDATION at checkout. While supplies last. Grooming Lounge offers 15% off all items in Odor category. Enter code READYSWEATGO at checkout. Valid thru May 25. Hautelook is having FACE atelier and NEO Hair Tools sale events today and tomorrow. Lord & Taylor offers a $25 Gift Card with any $100 beauty purchase. Valid thru May 23. MAC Cosmetics offers free shipping with any purchase. Enter code LASH at checkout. Valid thru May 28. Perfumania.com offers 20% off Sitewide Memorial Day Sale. Use Code MAY20 at checkout. Valid thru May 28. Perfume.com offers 10% off all Hugo Boss, Prada and Burberry purchases. Enter code BLOWOUT at checkout. Valid thru May 28. Plum District offers $20 for $40 Worth of All-Natural, Organic Products at Ecomom.com. Get the voucher before May 24 11.59pm. Prescriptives offers free 2nd day shipping with any purchase. No code needed. Valid thru May 24 3pm EST. Seen on TV Products offers $25 off and Free Shipping on Silk'n FaceFX purchase. Enter code FACEFX25 at checkout. Valid thru June 1. Shu Uemura offers 20% off and free shipping with any $50 or more purchases. Enter code SHUMEM at checkout. Valid thru May 28. This is the best deal I've seen from them since last Nov.
SkinStore offers 20% off sitewide. Enter code G2GSUM at checkout. Valid thru June 4. Stila offers free shipping and deluxe sample of Stay All Day Waterproof Volumizing Mascara with any $50 purchase. Enter code STILAMASC at checkout. While supplies last. Trish McEvoy offers free shipping and deluxe samples of Beauty Booster Serum and Beauty Booster Cream SPF15 with any $50 purchase. No code needed. Valid thru May 25. Yves Rocher offers free Waterproof Eye Liner with any $10 purchase. No code needed. Valid thru May 25. Burberry is having a Beauty workshop featuring their newly launched lip colours. Date: June 16, 2012 (Sat) Time: 2 - 4pm Registration fee: $30 per person, $50 for two. (Fully redeemable for Burberry Beauty products) Drop by the Burberry Beauty counter at Tangs Beauty Hall to RVSP and receive a door gift. Or call 6836 5516 for more information. Tangs is having a GSS Preview this Thursday May 24th. Both Orchard and Vivocity stores will open from 8am till 11pm. You will receive 12% rebate of you purchase using citibank cards, plus additional $20 beauty voucher with any $200 purchase. As Orchard Beauty Hall is current going through renovation, there are some Vivocity only beauty deals. And still some deals from both Vivocity and Orchard stores. Click to enlarge. Beauty.com offers free Cargo Mini Lash Activator with any $10 purchase. Enter thru link. While supplies last. Beauty Sak offers free shipping and deluxe sample of Alterna Bamboo Kendi Oil Dry Oil Mist with any $50 purchase. Enter code BAMBOO at checkout. Valid thru May 29. Benefit offers a free full size Pocket Gal with any $60 purchase. Enter code SWATH at checkout. Valid thru May 29. Bioelements offers free shipping and 3 deluxe travel size samples of your choice with any purchase. No code needed. Valid thru May 23. Bliss offers an additional 10% savings on Wellbox purchase. Use code WBX10 at checkout. Offer valid through June 30. Bliss offers a free Thairapy 365 Leave-In Conditioner (a $35 value) with any Thairapy 365 purchase. Use code HAIRGIFT at checkout. Offer valid through June 30. Caswell Massey offers a free set of 4 Sandalwood Soap with any $100 purchase. Enter code NDSW12 at checkout. Valid thru Jun 10. Cosme-De.com offers extra 30% off and free shipping on purchase of Lilyth and La Mauve products if you pay by PayPal. Enter code LILYTH30OFF or LA-MAUVE30OFF at checkout. Valid thru May 31. Crabtree & Evelyn is having a private exclusive super sale, where you can find 50% - 75% off select products. No code needed. Must enter thru link. Valid thru May 24. E.L.F. Cosmetics offers Buy 1 Get 1 Free from best sellers category. Enter code BOGO at checkout. Valid thru May 28. Estee Lauder offers free 2nd day shipping with any $75 purchase. Enter code APPRECIATION at checkout. Valid thru May 25. Note that this can be combined with the 7-pc gift with any $35 skincare/foundation purchase. Fresh offers free deluxe samples of Soy Face Cleanser and Creme Ancienne with any $100 purchase. Enter code SETS at checkout. Valid thru May 24. Hautelook is having a Dr. Brandt sale event today and tomorrow. Juice Beauty extended 25% off Friends & Family sale. Enter code FF2012 at checkout. Valid thru May 22. L'occitane offers free 6pc Hydrate On-the-go set in a cosmetics bag with any $65 purchase. Enter code ANGELICA at checkout. While supplies last. La Mer offers free shipping and a sample of the Moisturizing Lotion. Enter code DAILY at checkout. Valid thru May 27. Lancome offers free deluxe samples of Genifique Eye and Genifique Concentrate (a $68 value) and free shipping with any purchase. No code needed. Valid thru May 28. NeoStrata is having 20% off sitewide Friends & Family sale. No code needed. Valid thru May 29. Plus receive a free 10g sample of Exuviance Evening Restorative Complex with any purchase using code DELUXE. While supplies last. Peter Thomas Roth offers Instant Mineral SPF 30 for $12 only (a 60% saving). No code needed. Valid thru May 29. QVC offers Today Special Value TSV of Ojon Volumize & Restore 5-piece Collection at only $44.96. The set worth $109.50 and special price lasts for May 22 only. Sally Beauty offers 25% off on any $50 purchase. Enter code 555421 at checkout. Valid thru May 24. Scentiments offers 10% off Sitewide for Memorial Day. Enter code MEM10 at checkout. Valid thru May 31. Sephora is having 2nd day of 15 days of Beauty Thrill event. Get a free Taylor Swift full size Wonderstruck Rollerball with any $25 purchase today. Enter code 15DAYS at checkout. Tomorrow's gift will be Fresh deluxe sample duo. Shu Uemura offers a free limited edition Coin Purse designed by kimomo designer Mamechiyo when you spend $70 or more. Enter code MAMPURSE at checkout. Valid for May 22 only. Skincare By Alana is having a big Memorial Day Weekend Sale where you can save over 40% off organic skincare products. No code needed. Enter thru link. Valid thru May 31. SkincareRx offers up to 50% off select beauty products in their Beauty Vault sale. Enter thru link. Valid thru May 25. Too Faced offers free Deluxe Shadow Insurance with any $50 purchase. No code needed. Valid thru May 25. Whish Body offers Buy 2 Get 1 Free sitewide. Enter code may12 at checkout. Valid for May 22 only.